"Disguising Patriotism with Desert Hues: A not-so-subtly entitled exhibit jabs at Dubya’s saber rattling." Ahhh, the Soho sales. Go and buy, buy, buy. But if you’re looking to feel a little guilty about it, make a stop at Satellite, the Manhattan space of the Brooklyn gallery Roebling Hall. Appropriate in a space that represents Soho’s lost textile-industry, Jane Benson’s “Underbush” draws out the relationship among consumerism, fashion, and war. So ubiquitous is the fashionability of camouflage patterns in our culture, it blinds one to the militarization that it suggests. Andy Warhol’s series of camouflage abstract paintings, so foreboding and prescient in their day, now take on a wholly naïve character. Jane Benson, obscuring the glitz of holiday foil garlands with camouflage-colored spray paint, emphasizes a shift from fashion as ornamentation to fashion as not-so-secret weapon. The U.S. takeover of the world, for better or worse, will ultimately be achieved by cultural infiltration. This fact is not lost on the current administration, and they’ve made the policy clear: as a citizen, the best thing you can do to support America in a time of trouble is buy stuff. 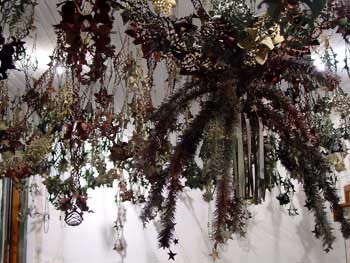 Benson’s once metallic garlands festoon the ceiling of the gallery in mimicry of the camouflage canopies utilized in military operations. The second piece in the show, “Camouflage Suit,” a mocked-up outfit with strips of fabric, brings a sense of the individual’s participation in all this, complementing the exhibition’s overarching theme of umbrage toward the military. Still, the title “Underbush” sells short the subject matter. It’s difficult to entirely blame George Bush for the relationship between fashion and war, especially in the context of lower Manhattan, where the predecessor to the textile industry was the munitions industry. Indeed, it is entirely possible that the gallery where the work is on view had a previous life not only as a textile warehouse or sweatshop, but as a guns or ammo factory.